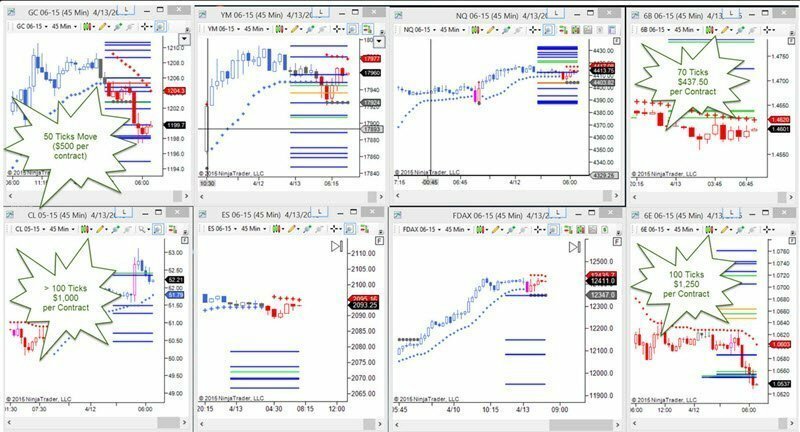 TradersHelpDesk offers trading indicators that work for NinjaTrader, Multicharts and TradeStation charting and scanner programs, with an emphasis on futures, forex, stocks and binary options. Regardless of what you are trading — these indicators work — futures, forex, commodities and stocks! As you can see in the video below, these indicators are leading and predictive of what will occur in the markets. And as the video shows, instead of staying glued to your screen all day, waiting on a trade to setup, and then taking a trade out of boredom, you know, in advance, when your trade is setting up and when you need to be at your screen. And what happened? You can see that these are the trading indicators that work!. As shown below on the charts, if one had traded one contract of each opportunity, the total profit would have been more than $3,000. This all happened within a 3 hour period. What did a trader have to do to trade these setups? One has to understand the indicators, wait for the retracements and the signal for entry. (These required elements are also known as a trading discipline.) In the short video below, I explain how these trading indicators work and how they identify support, resistance, divergence, and market retracements. Traders must also spend time to learn my approach to volume — that is unlike any other in the market. I have studied volume profiling, cumulative delta, and just about all the other approaches to volume analysis. The issue with most of these approaches is that they are extremely difficult to apply on the live edge of the market. I designed my volume indicator to give the trader an instant edge — it combines price bar analysis with volume analysis so that you can identify where the price bar most likely go next. Volume truly is a leading indicator if you are using my approach then these trading indicators work on any market, and any minute timeframe. Traders are now able to limit their risk thru the use of Out of the Money Binary Options while on the path to profitability. Even at a 50-50% win/loss ratio, traders can actually be profitable while learning my methodologies and indicators. I show how this is done in my paid binary options signal room. In the video below, I show how trading binary options can be done profitably using Out of the Money Binaries. On this particular day, I made over $800 trading market reports. Again, showing that these are the trading indicators that work!